Hidden River Lodge is a newer condo development in Keystone CO Real Estate, located only a short walk to the Mountain House village area of Keystone, Colorado. Built in 1999, these Keystone condos feature functional floor plans and comfortable finishes. Amenities include outdoor hot tubs, fitness room, lobby, ski lockers, and underground unassigned parking. Hidden River Lodge is comprised of 60 units, 12 – 1 bedroom units, 39 – 2 bedroom units, and 9 – 3 bedroom units. Homeowner Association Dues at Hidden River Lodge range from $350 – $600 per month and includes cable television, internet, heat, electric, water/sewer, snow removal, trash pickup, maintenance and common area insurance. 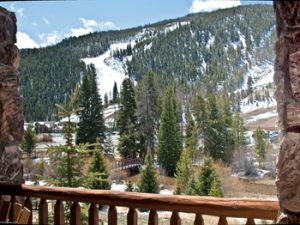 Finding Keystone CO Real Estate with Keystone Ski Resort and Snake River views can be difficult but not for some of the units at Hidden River Lodge. Units located on the south side of the building feature Keystone Ski Resort and Snake River views. While units on the north side have mountain views. When viewing condos for sale in Keystone CO ask us to show you Hidden River Lodge condos.